Let Me Tell You a Story… Dang, this is pretty cool. 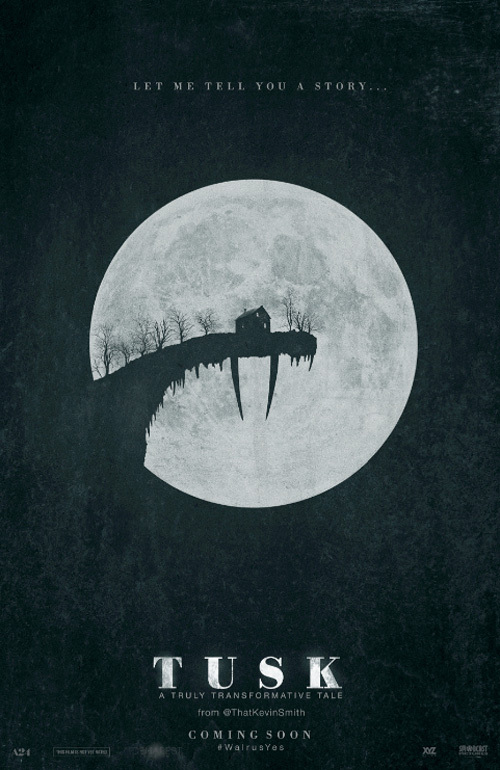 A24 has unveiled the first teaser poster for Kevin Smith's Tusk, his new horror film about a walrus man, or something like that. We have yet to actually see a teaser trailer in public, however it seems like A24 is getting ready to launch one following this poster. The artwork features a moonlit house positioned on a cliff, with tusks sticking out beneath it. It's impressive imagery for an official studio poster, and is quite a teaser for this horror project that has been kept quietly under wraps since Kevin Smith started production. Now they have my attention; I'm intrigued to see more from this film. The trailer is set to debut online in full after it unveils at Comic-Con later in July. Check out this art below. This is an awesome poster. Would love a copy of this. Gotta agree, this is a pretty cool poster.